6.42 points at 12 votes (rank 538). 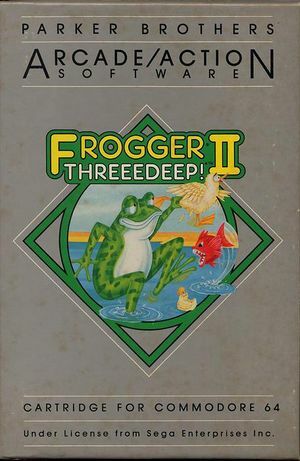 Frogger II: ThreeeDeep! is a skill game developed by Parker Brothers from 1984, which was planned as a follower of the home version of the arcade hall hit "Frogger". 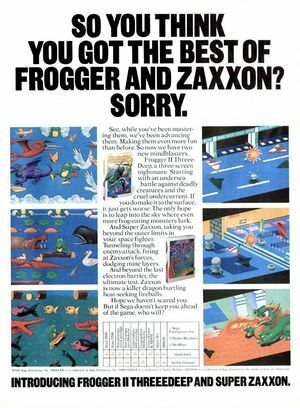 Parker Brothers had bought the licence from Sega, to publish cartridge versions of Frogger (the rights for the disk version went to Sierra Online) and their version of the game from 1983 turned out to be a hit. Therefore it was reflected that the licence should be used again very soon, with regard to the collapse of the video game market being on the horizon, and repeating the success of the previous year. It was to be the last game that Parker Brothers published for the C64. 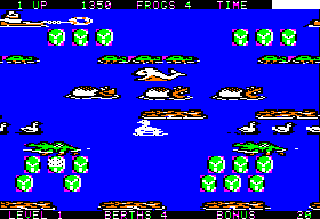 The course of the game is mostly identical to the one of the forerunner: a frog needs to be steered to a destination through obstacles and predators within a time limit and can collect bonus points on the way there. 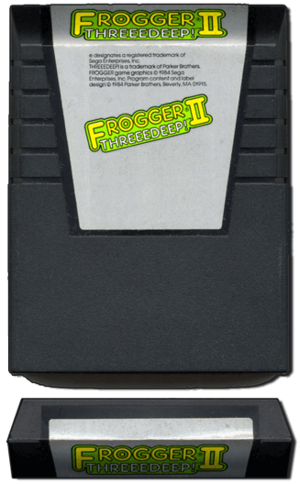 The innovation in Frogger II:ThreeeDeep! is, that its contemplative idyllic pool has obviously become too small for the frog: it wants to go out into the wide world, namely onto the open sea and find even in the highest heights a cloud-cuckoo-land. 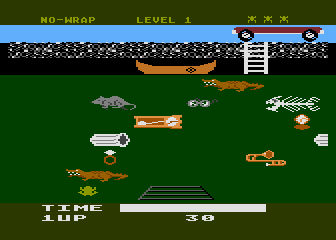 If it manages to move into all hideouts in all three screens, the game continues with higher speed, bigger number of obstacles and dangers and additionally more frogs need to be brought home. At the start of the game you have 5 screen lives and get the possibility to earn an extra life in the third screen (s. hints). The player sprite, the enemies and other objects are good to recognize and are displayed flicker-free, but they are only sparsely animated. The collision query is for the most part exact, when jumping into the target caves it is even generous towards the player's advantage, in return it is more nitpicking in the first screen when collecting the air bubbles. If you wait a few seconds in the start screen, the game shows the alignment and behaviour of enemies and other objects in the higher levels. The game has a short but very catchy title tune as well as numerous more or less fancily sounding sound effects to underline the happening in the game, e.g. an alarm jingle when the time is almost over or when you get an extra life. Frogger needs to reach a number of shelters in all screens under time pressure, the number rising with each level. However, Frogger can change to another screen any time voluntarily or fall back nonvoluntarily. If he jumps off target, this will cost him a life. So he is free to solve the screens in whichever order he wants to. 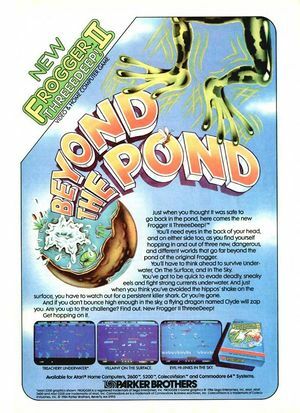 As soon as half of the time has run out, a baleful warning sound is rung, if it fully runs out or Frogger touches the left or right border of the screen, he will instantly go to the big pond in amphibia heaven. 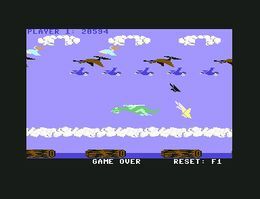 In this screen you need to fill three nests in the uppermost row of the floating logs in all levels, before the screen is solved. An invisible current pushes Frogger to the border of the screen, if he doesn't jump in the opposite direction. If Frogger jumps onto an already occupied log or next to the opening, he will get to the next screen. Alligators and killer carps are - as expected - hostile and need to be avoided. The small swarms of fish are not dangerous, but they hinder the movement a bit. The turtle "Joe" paddles lethargicly from left to right through the water. Frogger can jump on it or let himself be picked up by it and as long as he gets transported by it he is protected by enemies and the collision with the border of the screen. Frogger can gather bonus points by collectiong air bubbles , which is 100 points per bubble. This is however only added to the score when he reaches one of the three nests in the logs. If he leaves the screen, the bonus will expire. In later levels, "Larry" the eel will join looking out of one of his holes for frogs. You have to avoid him, because touching it would be fat"eel". Don't be a frog and try to steer Frogger to the tug boat with the life buoy and this precisely into the ring and not against the boat, or else you will have one Frogger less and the boat will need new paint. 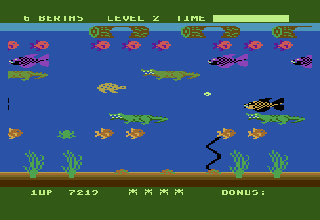 If Frogger falls into the water, he sinks back down to the ground of the first screen. The water lily leaves can be collected for each 10 bonus points, which are - as in the previous screen - only added to the score when reaching the destination. But beware of the shark , that makes his rounds in later levels! The alligators are completely harmless in this screen, same as the turtles , which do not dive down as in the forerunner game, but do their laps nicely. Equally harmless are the young ducks , but Frogger needs to beware of the mother bird , this is why a warning sound rings as long as Frogger is sitting on its offspring. If Frogger jumps on the mother bird, he gets into the third screen. In the first few levels the hippos and the grinning whale are still rather cooperative. But later the hippos start to shake themselves all of a sudden and the whale dives down in regular intervals. In both cases Frogger will then be sent back to the depth of the pond. Look ahead: a pteronadan...peterrandom...pteranodummm...ah well, a flying dinosaur! 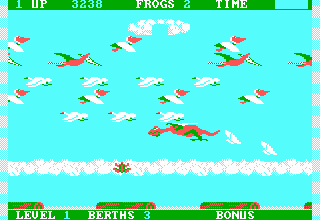 The ambitious goal is in the clouds in this screen and Frogger can only reach them by getting transported by the altogether harmless birds on their back But first you have to take lots of swing on the apparently elastic clouds, to be able to reach at least the lowest row, by jumping up several times. O.k., not all creatures in this screen are harmless: these are the dragon Clyde and the only later appearing poisonous butterfly lady "Beaulah Blackwing" , that costs a life at a collision. The other butterflies can be collected for bonus points and additionally open gaps in the cloud cover, through which Frogger can fall down voluntarily or involuntarily back into the ocean. 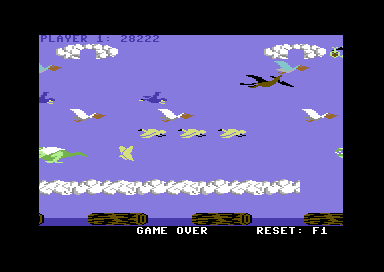 Each time, Frogger has reached 10.000 points, a stork will pass at the upper border of the screen. If Frogger touches it, there will be offspring: an extra life. The chance to reach the stork is there for Frogger only once every 10.000 points, if he loses a life during trying, the stork will not appear again. You need to keep the distance to the rattling double decker , or else Frogger will end up between the propeller blades. The time bonus is neglectable as you only get one(!) point per second. In the first two levels there is enough time to collect bonus points with collecting the bubbles in the first screen. In the second and third screen it might be necessary to change between the rows with the possiblities of transport to avoid being squashed at the border of the screen. In the third screen Frogger can hop to the row with the blue birds if he has enough swing. Robotron2084: "A charming and wonderfully uncomplicated game, which is well for a warm up or a finish of a long C64 game night and it is really a successful follower of a classic, which is not always a matter of course for computer games. Only that there is a whole point per second of the time that is left, I find really rubbish, because then a fast game is not rewarded and the first levels last longer by this, because you can better collect bonus points than hurry up. Creative and playable enough for 7 out of 10 points. ."
H.T.W: "I was up all night with this game on the Colecovision and a friend of mine not very long ago. Only look shortly into it, ah yes...". The sewers as a biotope where disposed of pendulum clocks, trumpets and wedding rings can coexist peacefully next to each other. As Sega themselves did not release an official follower of Frogger as arcade machine, the team of programmes at Parker could at first act as they wanted concerning the design of the game. However, the managament decided for not taking any risks, for largely keeping the course of the original game and avoiding too weird experiments. 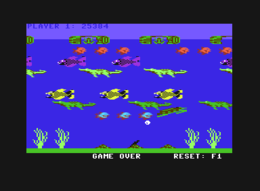 One of the experiments was the sewer canal level, that only made it to the prototype of the Atari 8bit version, where Frogger was supposed to hop around between canal rats, canal alligators and reanimated fishbones. According to the C64Preservation Project and several comments from collectors on Lemon64, there is an in the original utterly rare disk version of the game by Sega, which is completely identical except for the loading screen. 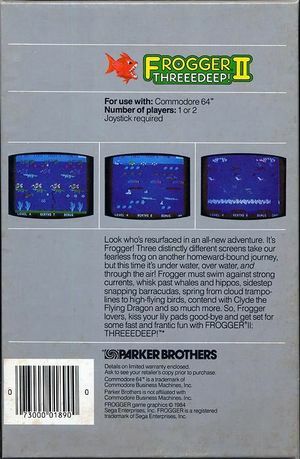 The name, however, is "Frogger II: Three Deep!". In the cartridge version, the threefold letter "e" in Threeedeep is apparently supposed to underline the fact, that the game comprises three screens. The game was listed in the selection of the shady "Sonnenverlag" under the name "Froschhüpfer". PC DOS version with CGA graphic. This page was last modified on 30 June 2018, at 21:29.